Happy sheets are not enough! You are investing a lot of time and budget, and want to know if and how successful a development measure really is? The Kirkpatrick model is the most comprehensive model on the market for the evaluation of the effectiveness of HR development measures. Of the 4 levels of the training evaluation – participant satisfaction, learning success, change in behaviour and company success, Jim Kirkpatrick puts the latter in first place. A programme is successful only if it verifiably and measurably supports reaching the company goals. As the only Kirkpatrick partner in the German language region, we offer HR developers, consultants and trainers the possibility to learn the original Kirkpatrick methodology and find out how they can contribute to maximise corporate results from now on by application of the “New World Model”. Our 2-day workshop with the certified Kirkpatrick Trainer Masha Ibeschitz-Manderbach is the basis for the Kirkpatrick Bronze certification. thereby contribute directly and measurably to the company’s success. Masha Ibeschitz is an expert in the area of learning effectiveness, leadership and management, communication, organisation development and train-the-trainer. With this knowledge, she already accompanied companies like Asfinag, Hornbach, Mondi, OMV, PwC, Telekom Austria, voestalpine and many more. 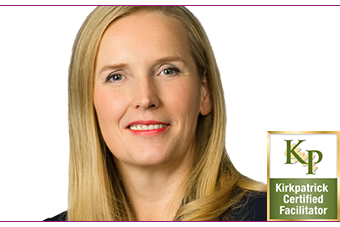 She is also the first and only trainer, who provides the Kirkpatrick certification in the German area.